Random Thoughts by Rebecca: Did you see that? I'd say the chances of me receiving a Parent of the Year Award are about as likely as me getting the Heisman Trophy. I'm not even in the running. I am a pretty good apologizer and a good back up planner. I mess things up, pretty regularly. We have a therapy fund instead of a college fund. I'm not all that consistent. Some days it's all, "NO EATING IN THE LIVING ROOM!" Then later that week, "Ok, kids, mommy brought home pizza, gather in the living room and let's eat and watch Survivor!" Yea, no Mom of the Year award for me. There are a couple of things I am proud of and I work at to be consistent. I work really hard to help my kids, "see". Yes, my son has glasses, but that's not where I'm going with this. A few places this 'see' thing plays out. Try and "see" things from the others point of view. Everyone has a story. If my son would come home talking about how some kid had been a jerk on the bus, I'd remind him that maybe his parents are jerks and the kid is really just hurting and looking for attention. What you go looking for, that's what you're likely to find. Go looking for trouble, yep, there it is. Go looking for the good stuff, yep, there it is. Don't wallow in the crud, look for something that doesn't stink about the situation if you can. When the kids were home with the flu a few weeks ago, it was good to at least slow down and spend some time together, even if it was in a Motrin cloud. Take the time to see the small stuff. The beautiful stuff. Notice. Sunday night, I made everyone stop their SpongeBob, their Matchbox infatuation and their football game to come to the front window. There was the most beautiful sunset ever. It had to be seen! I'm proud that some of my "see coaching" is starting to stick. Way better than, clean out your backpack or brush your teeth. Just the other day I was going off on some tirade and my son said, "Gee Mom, that's not a very positive way to look at that." Love it when it gets thrown back at you! I want my kids to see, to notice, to be present. I raced through several years of my life. I realize that getting there first isn't as cool as stopping at the rest stops and taking pictures along the way. 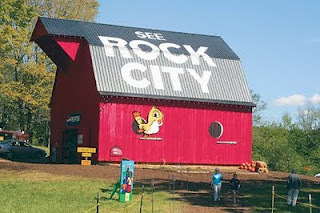 Taking the time to really See Rock City. Not just buzz by on the interstate. And last week while walking through the woods, the girl who is 8, took this shot with her new pink camera. Because often, the best view to really 'see' is the one looking up.